Issue 105 of the Gobrecht Journal featured an article about the 1853-O filled O quarter. I had the good fortune of acquiring a very early die state (pre filled O) that could conclusively be shown to be the same reverse die and wrote a fairly detailed article about it. One of our numismatic colleagues whom I asked for an opinion on an early draft of the article had said it would be nice to show a die progression as the mintmark fills. My response was that it would be great to show such a progression if the coins could be found. Neither he nor I had the necessary coins at the time so no such sequence was shown. Now, two years later, I have acquired additional examples of the die pair and am showing in the figure included with this column six coins with the mintmark in various degrees of deterioration. The search that has been ongoing for the past two years has revealed that, though rare, or at least very scarce, the early die state is available from time to time. I think that it is frequently mistaken for the 1-A die pair, which on initial inspection is difficult to distinguish from the early die state of reverse E (which is the filled O reverse in later die states). 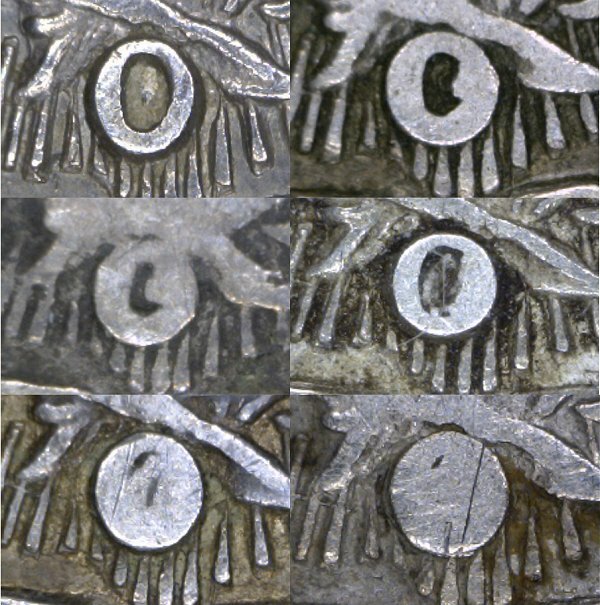 Three of the earlier die state “filled O” examples acquired over the past two years have been purchased unattributed and at prices that were moderately below sheet.